St Albans – Birmingham signage and graphics specialist Hollywood Monster has again turned to Zünd UK Ltd to help accelerate its production, in particular on a major contract with McDonald's. Hollywood Monster is all about making an impact, following its birth in 2009 as a result of a merger between Hollywood Signs and Monster Digital – businesses with legacies stretching back decades. It's known for its large-scale work such as built-up letter signage for major retail destinations, billboards, floor, window and ceiling graphics, construction project board signage, wayfinding and much more. Birmingham's Mailbox complex, the NEC's many food outlets, Premier League football teams' grounds and many more clients across the UK have had the 'Monster Impact' treatment. In 2010, the scale of Hollywood Monster's printed output created a significant bottleneck in its finishing department, which at that time relied on hand-cutting processes. The company therefore looked to invest in a digital plotting table. "We couldn't continue hand-cutting all of our flatbed-printed output – on materials like board, Foamex, Correx – as our team couldn't compete with the speed of the printers," explains Mat Jephcott, Operations Director at Hollywood Monster. "We knew the name Zünd as the best brand out there so chose to install a Zünd G3 3XL1600, which has been great – very reliable." When Hollywood Monster's printing department put its foot on the accelerator again, following investment in two new UV-LED wide-format printers, the company returned to Zünd for additional finishing capacity. A Zünd G3 L3200 got to work alongside the older G3 earlier this year. The second G3 is crucial owing to an ongoing contract with McDonald's, whereby Hollywood Monster completes around one-third of the interior graphics work for McDonald's restaurant refurbishments in the UK and Ireland. The new Zünd G3 L3200 is used almost exclusively for these jobs, typically wallpaper and interior signage. "The contract with McDonald's has been in place for around four years but the new Zünd has enabled us to really open up the work," says Mat Jephcott. "It's the same model as our existing Zünd but more compact, which is ideal for handling smaller rolls of wallpaper and vinyls while the first Zünd processes rigid boards. "The two systems use the same software so the team didn't need training on a new system, but it was the reliability which really led us back to Zünd. It's a brand we know we can trust. It was a no-brainer." Steve Rowbotham, Sales Account Manager at Zünd UK Ltd, comments: "Hollywood Monster's investment in a second G3 shows the versatility of Zünd's modular design. Operators can use the software and ergonomic set-up that they're used to, but select from a huge combination of options – its size, material handling modules, tools and hi-tech extras like the Over Cutter Camera (OCC), LM 100W Cut and Seal Laser Module for fabric, the RM-L 3.6kW router spindle or Automatic Router Bit Changer. And the beauty is that these modules can be changed or upgraded at any time, future-proofing the investment." Mat Jephcott and the team visited Zünd UK Ltd's stand at Sign and Digital UK in April 2018 – held at Birmingham's NEC, close to Hollywood Monster's site in Tyseley, east Birmingham – but 'just to see what's out there'. "We have no further plans to invest in new equipment at the moment, but we'll have absolutely no qualms about going back to Zünd when the time comes," he says. For further information on Zünd cutting systems or to book a meeting at its showroom in St Albans, please email salesuk@zund.com or call 01727 833003. 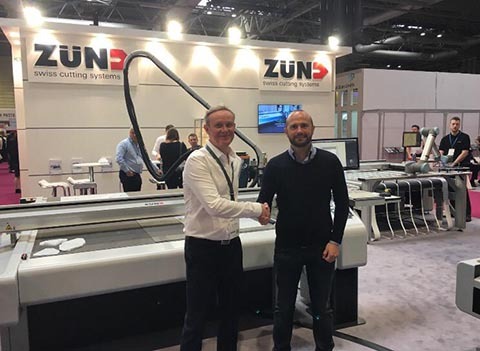 Mat Jephcott (pictured with Steve Rowbotham at Sign and Digital UK) says Hollywood Monster's decision to buy a second Zünd G3 was a "no-brainer."